as you all know, i am constantly posting rich desserts. recently, one of our po' man friends michelle congdon, (who has been with us from the beginning) commented on my double chocolate peanut butter crunch brownies and said, is there a low calorie version? and i said, 'um... no.' she responded, 'then savor one for me!' 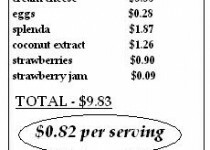 so i told michelle i would make a low calorie dessert just for her. she told me that she loves cheesecake, coconut, chocolate, strawberry and coffee. so i took 3 of her loves and transformed them into this recipe. i have to admit, this is a tad bit out of my realm. but i think i did okay. these cheesecakes are 112 calories each. not too bad, huh? michelle, i hope you like it! preheat the oven to 350 degrees. line a muffin tin with paper liners. put the graham crackers in a sandwich bag. seal it and using a rolling pin or something hard, smash the crackers into crumbs. melt the margarine in the microwave. stir the margarine into the graham crackers. along with 1/4 cup of the coconut. spoon about a tablespoon of the mixture into the prepared cups. bake in the preheated oven for 5 minutes. remove from oven to let cool. meanwhile, blend the cream cheese and splenda using an electric blender until smooth. make sure there are no lumps by making sure that your cream cheese is room temp. add in the eggs, one at a time, blending until mixed. add in the coconut extract and blend until creamy. spoon the mixture into the cupcake liners over the cooled coconut graham cracker mixture until almost full. bake in the oven from 15 minutes. it is okay for the center to still be soft. try to remove from the oven before it starts to crack. allow to cool completely. then refrigerate for at least 1 hour. meanwhile, line a cookie sheet with aluminum foil and spread the remaining coconut onto the tray. place in the oven and bake along with the cheesecakes for about 5 minutes or until lightly browned. your nose will tell you when it is ready. remove from the oven and allow to cool. in a small bowl, melt the strawberry jam in the microwave for about 10 seconds. stir in the chopped strawberries. set aside. 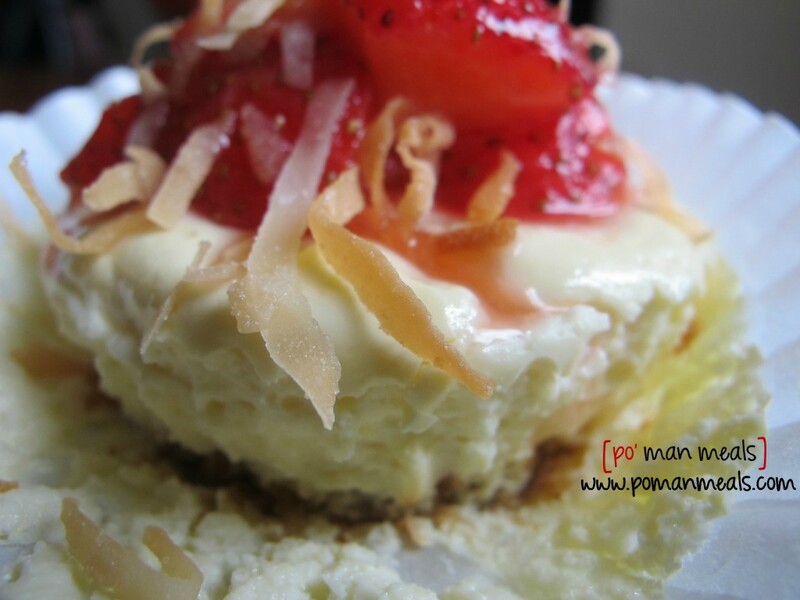 once the cheesecakes are ready, spoon some of the strawberry mixture over the cheesecakes and garnish with the toasted coconut over top. I can’t believe they’re only 112 calories each! D E L I C I O U S !!!! !